Just like taking any other exams, you may feel both nervous and excited once the schedule is fast approaching. It’s normal and all you have to do is to prepare for the upcoming Civil Service Exam 2019. This is also true if you’re about to take the Civil Service exam. Preparation would take few months to ensure that you’re ready to take the exam. You should be serious with your review sessions and as much as possible set aside those things that would distract your focus. It can also help in your preparation if you know some of the important things to remember about the exam such as the date and time, the venue, and things you need to bring during the examination day. Likewise, try to look for helpful tips on how to pass the CSE. The Civil Service Commission is giving civil service exam twice a year. This year the CSE-PPT has been scheduled on March 17, 2019 and August 4, 2019. If you’re unable to take the first schedule, you can take the CSE scheduled on August 4, 2019. Filing of application is from May 6, 2019 to June 5, 2019. The acceptance of the application is based on first come, first served. To ensure that you can take the exam, you should file your application as early as possible. The acceptance of the application will be closed if the target number of applicants is reached. There are different testing centers designated throughout the country for the civil service exam. Each regional office has designated testing centers and you can check from the regional office near you or check at the official website of CSC. The Civil Service Commission will inform all the examinees about their school assignment through the ONSA. Once you receive the notice make sure to print it for your reference. You can verify directly in the CSC Field or Regional office where you’ve filed the application form in case you don’t know the school assignment or cannot access ONSA a week before the exam. Days before the exam try to visit your school assignment so that you’ll know where you’re going on the examination day. It will help reduce the stress, thus keeps you relax during the exam. What to bring during the examination day? As much as possible, you should bring the ID you had presented when you filed the application. Otherwise, if you will present different ID you’ll need to present other documents such as passport, driver’s license, PRC license, UMID, Voter’s ID, and etc. Keep in mind that you’ll not be allowed to take the CSE without a valid ID. Before you start reviewing, you need to know first the coverage of the CSE. This way, it will be easier for you to review for the covered topics. It’s not necessary to memorize the answers for possible questions, but rather familiarize the question. Whether you are taking the professional or sub-professional exam, you should include vocabulary, an organization of ideas, grammar and correct usage, word analogy, analysis/synthesis, logic and abstract, data interpretation, as well as reasoning and numerical reasoning both in Filipino and English. In the professional level, the examinee should expect around 170 items and should be completed within 3 hours and 10 minutes. While the sub-professional exam composed of 165 items to be finished within 2 hours and 40 minutes. The Civil Service Exam passing score is 80%. The list of successful examinees will be posted on the official website of CSC 60 days following the examination date. The certificate of eligibility can be claimed at the Civil Service Field or Regional office a month after the list of passers is posted. 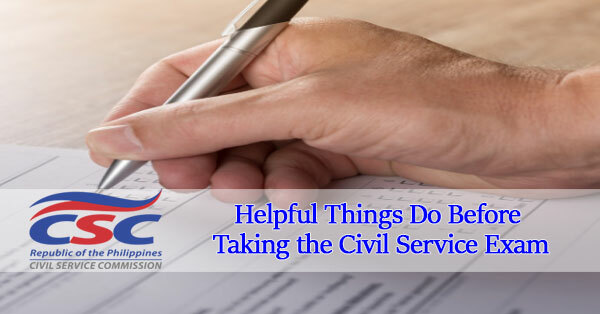 What to do when taking the Civil Service Exam? Once you filed your CSE application form, you should keep in your mind that you need to pass the exam. Preparation is a must and you should review and study all the topics and subjects covered in the examination. Use review materials/resources to obtain more information. Set a schedule for an effective review session. Once you start the review, continue until the time of the examination. Understand the concept of the information. Analyze the formula and determine how the answer was obtained. Focus more of your time on subjects that you’re not familiar. Take a break after the review sessions. Exercise, sleep and eat healthy and brain-boosting foods like dark chocolates and nuts. During the examination day, bring all the required documents and IDs, water and snacks. Relax and think positive. Before starting the exam, take deep breaths and pray silently. Listen and follow the instructions of the proctor. Start with the difficult questions, but don’t spend much of your time on it. Remember that you have limited time that’s why you need to maximize it. As much as possible, never leave questions unanswered even if you’re not sure about your answer. Review your answer if there’s remaining time so that you can make necessary changes. When taking any type of examination, you should believe in yourself and ask God for guidance and wisdom. You what you can also be exempted to take the Civil service exam if you have the following qualifications.